The trend of decline on coverage in matters related to educationin compare to the weeks when Dr KC was agitating continuedfor another week in the media.Innovations by students, school management and local governments were covered in the news. Assessment of schools through mobile after installation of CCTVs, students creating business out of localherbs to make medical food supplements, and courses offered by Nepal Open University werethe news covered by the media. The policy news this week was about the proposal submitted by the Ministry of Education, Science and Technology (MEST) to discontinue Resource Persons Program, stating it irrelevant in the new federal structure. An opinion article stating the importance of the role of parents as educators for children was published this week as well. A news about Changunarayan Municipality’s decision to run Changunarayan Engineering College after the college was in controversy for a long time was also published.Confusion in the rights and responsibilities of different levels of governments caused by the delay of Federal Education Bill was covered in a report story by Himal Weekly. The only news about medical education published this weekwas about the relay hunger strike by the students of Gandaki Medical College as it continuedstating that the college had fleeced them.Below is the analysis of other news this week. - Assessment of school activities through mobile phone after CCTV was installed in a public school in Chitwan was covered in the media. The technology enables a Ward Officerto scan the premise of the schools any time from any place with internet connection. The assessment was also assigned to the school principle and a teacher who could review the school compound and classrooms and check on teacher presence, and student activities from a distance. Such a focus on techno-based solution cannot be universal for its cost and should not be regarded as a solution or replacement to building trust relation among management, teachers and students. Often considered as advancement, it is the indicator of the lack of discipline established through a process of pursuationand a move towards regimentation of children and teachers. School should not be like a police-state. Seemingly useful now for short-term, it may have devastating consequences. It is a breach of privacy and degradation of humans as human-beings. The negative aspect of such technology-based monitoring and its impact in the human relation in school premise needs to be well analyzed. The use of technology for different purpose should be addressed through policies and guidelines that could be formulated at local level. - No end is in sight of Gandaki Medical College students' agitation was also regularly reported this week. Studentsof the college is in a relay hunger strike with demands that the college should fix the fees as per the government’s policy, return extra charged fees, give a receipt for the paid amount. News about the unwillingness of the administration to fulfill the students’ demand was also reported. The irregularities in medical education sector have been one of the most highlighted issues about education by the media in recent years evoked by the continuous agitation by Dr. Govinda KC to call for stronger regulations. Even after the present governments claim that the policy passed from the parliament has addressed all the demands to ensure fair and just practice in medical education, the news about students having to protest for the implementation of the government’s policies questions the commitment by the government. It also highlights the fact that irregularities and commercialization of medical education sector is yet to be checked. - A news reported that Resource Persons (RP) program was proposed to be discontinued by the MEST. A proposal to this effect was submitted to the Cabinet. There are 1053 RPs at present in the country. The minister stated that the responsibilityof school education till secondary is under local government.Therefore,it will be the responsibility and authority of local government to hire RP's if required. He stated that it was irrelevant for the federal government to appoint RPs under present policy.It is planned to deport the RPs with facilities equal to the outgoing temporary teachers. RPs who arepermanent teachers will return to the schools from where they were deputed.The issue of teachers who are holding the position of those teacher has been raised, who will have to quite the job if replaced by returning RPs- states the news article. This is a rare act of the federal government showing commitment to devolution under the federal structure particularly in education sector. It is yet to be reported how the new policies will ensure authority to local government. Students of Janata Campus, Dang, Bijauri, present Chyawanprash, a traditional Ayurvedic tonic produced out of local herbs. Kantipur, Feb 17, 2019. Highlighting of innovative efforts by academic institutions and students by media is of utmost importance. This will definitely motivate more innovation and also support teachers and institutions encouraging innovation in education. This should not be a rarity news. - An opinion article written by a school teacher ‘Parents are the first teachers’ was published this week. It stated that parents should be more respectful and friendly to build a trusted relation with children instead of controlling and always striving to discipline them. It called for elders to respect and recognize children's will and interest. It also highlighted the lack of time for children in the busy schedule of today's parents.The article urged parents to take children to travel together and visit new places for new experiences. The author also stated that it has become important for the students to realize that society is larger and greater than education at school. It should be noted that there is increasing number of opinion articles that discuss about the role of parents in children’s learning experience recently. There was an opinion article covered in the similar topic last week too. Such articles however, often unconsciously confine on urban middle class while forgetting the issues with rural and low income parents. - News about school merger policy becoming abarrier for access to schools for marginalizedcommunity was covered in the media this week. A rural municipality in Jhapa had listed a school to be merged due to low number of students. The school is the only accessible academic institute for the children of the marginalized community, who fear their children will lose access to school if the only school is merged with a farther one due to low student turnover. The next school was reported to be 3 km away from the village. Parents and Ward Officer expressed their worries and are trying to save the school from shutting down. The Ward Officer claimed that the municipality failed to analyze the situation in ground before suggesting merging schools. The impact in access to schools for community with littleresources and high illiteracy needs to be considered. Merger based only on the number of pupils would impact marginalized communities the most, who should be the focus of the government to ensure access to education for all. The government should prioritize on socio-economic aspects than mare economic factor, when planning for school merger. - A report by Himal Weekly states that there is confusionatevery level of governance including schools as promulgation of federal education act gets delayed. Delay in federal education act, has preventedpolicy formation at local level, teacher appointment and school management- it reports. It states that the Law Commission had submitted a draft of Federal Education Act to the MEST 7 months ago, but the Ministry has yet to submit the billto the parliament. The conflict of interest about private schools, fees among many other aspects and the lack of interest of the federal government to decentralize control of education has been argued by observers for the delay. - An international news chosen from BBC online news portal this week discusses about ‘10 global megatrends facing education’ written by the Director of Education and Skills of the Organization for Economic Co-operation and Development(OECD). It discussed about the international trends that are likely to affect education systems around the world. The factors identified by the article were raising wealth gap and its impact in social mobility which needs to be addressed by education, the rise in consumerism and its impact in school system, increase and changing trends in migration, the raising demand for higher educationand raising household debt around the world at the same time, increasing use of digital technology as source of information, artificial intelligence and need for education to focus on human skills that can address changing job markets, disappearance of job for life and changing dynamics of the workforce and lessons for life education, internet access and dependency among new generation, increasing polarization of political values globally and its impact in teaching values, global gap between nations in aspect of access to schools and technology and the raising challenge to ensure equity for all. Many of the trends mention in the article will be of relevance to the context of Nepal in the long run. While forming policies and curriculum, the government should also consider the trends, recommendations and approached taken internationally. Many of the trends are being followed in Nepal, such as increasing use of technology among students. It would be important to learn how other societies have addressed similar context and prepare policies and approaches based on their experiences while contextualizing it to Nepali context. Some other news to be mentioned here were: a) one is about the student leader who visited a private college to form their branch of their political wing was beaten in the college. The group claimed the college establishment planned the conflict while administration claims the clash was between students for and against the proposal to form a branch of the political wing in the college. b) News about thousands of children out of school in tarai region was followed this week as well. The lack of strategy to hold the children in school and focusing only on admission campaign was regarded as a failure. Lack of child friendly approaches in schools was also highlighted in the news. c) News about distance medium courses offered by Nepal Open University was also discussed in a news story.d) An opinion article mentioned that the higher education in Nepal was likely to remain stagnant as political interference in the academic institutions was yet to be identified as a matter of concern by the government. 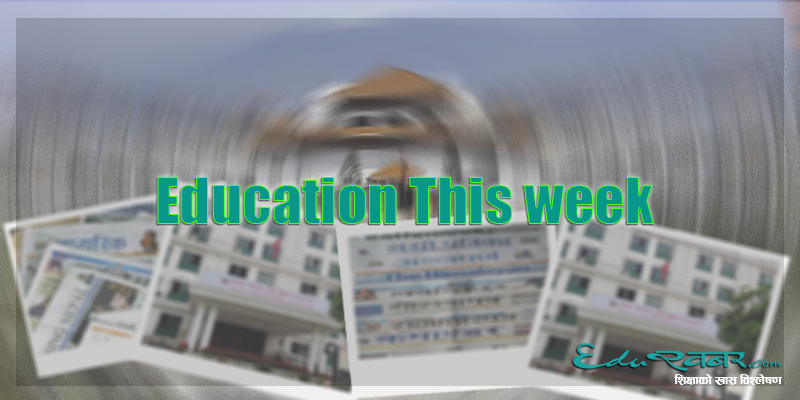 'Education this Week' is a joint effort put to analyze the press coverage of education in Nepal’s print media published in Kathmandu. The main aim of this effort is to identify and explain major education issues picked up by the media and give back and foreground of the news.This, we believe, will help policy makers and other responsible people to keep abreast with ongoing concerns and discussions on and around education. 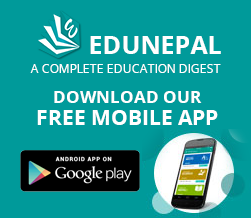 EduKhabar, in collaboration with the Center for Educational Policies and Practices (CEPP) , has produced this analysis based on the news printed in Kantipur (Nepali) and The Himalayan Times (English), Dailies, Himal Weekly(Nepali) and BBC.com(international online portal)between Feb 13-19, 2019 (Falgun 1-7, 2075) - Editor.